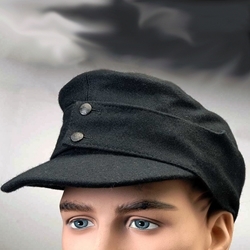 The reproduction German WWII M43 Black Tankers or Panzer Field Cap is a wool cap with lining. Used by armored troops and can be worn by all ranks. Features fold-down ear flaps with cloth loops and pebble finished buttons. Marked in German Army sizes and corresponding US hat sizes. Sizes: 56 (US size 7), 57 (US size 7-1/8), 58 (US size 7-1/4), 59 (US size 7-3/8), 60 (US size 7-1/2), 61 (US size 7-5/8), 62 (US size 7-3/4).